And I don't mean the grocery store. It takes a lot of effort to grow healthy food like fruits and vegetables. Having a backyard vegetable garden helps build respect for what it takes to put healthy food on the table. It's lots of fun too! 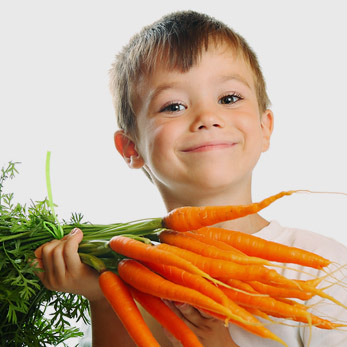 Kids quickly discover the joy of growing their own food,...and eating it too. Sometimes they're surprised by how much better everything tastes when you grow it yourself and eat it fresh. Gardening is a wonderful activity for children. It gets them out in the fresh air working closely with nature and teaches them about the cycles of nature. It demands patience and provides bountiful rewards for a job well done. So, designate a spot in your yard for a vegetable garden. Be sure to name it. Then plan out what you would like to grow with your child. There are lots of different fruits and veggies to choose from, like Cucumbers, Strawberries, Onions, Green Beans, Garlic, Oranges, Lettuce, Tomatoes, Carrots, Celery, Squash, Zucchini, Peppers, Potatoes to name a few. And those are just the start! So Grow it! Try it! Like it!